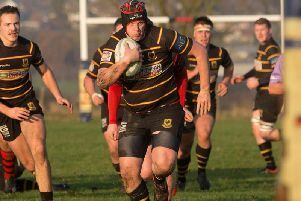 Player-coach Dan Bird was a try-scorer in Harrogate Pythons' loss to Knottingley. 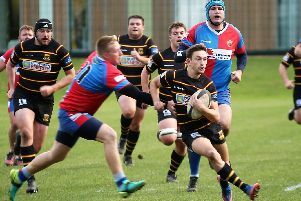 With a number of 1st XV regulars unavailable, coach Dan Bird used the game as an opportunity to cast his eye over some of the club’s 2nd team players. Things did not begin particularly well for the hosts, however, and they fell behind after just two minutes of play. Knottingley kicked deep and ‘Gate tried to run phases from inside their own 22, until the ball was spilled forward. The visitors then went through a couple of their own phases before their number eight broke through to score by the posts for 7-0. Eight minutes later, from a scrum on the Pythons’ 10-metre line, the Knottingley scrum-half switched the direction of attack and created a simple overlap for his winger to cruise over in the corner. A big tackle from full-back Matt Halpin prevented another touchdown, however a clean break from the Knottingley centre saw him link with the visiting number eight who scored his second of the day under the posts. Things went from bad to worse for Bird’s men straight from the re-start when they were penalised and Knottingley went for the points. Their shot at goal struck an upright, but bounced kindly for one of the away locks to gather and power over in the corner, putting the visiting team 26-0 up with only half an hour gone. There were no further scores before half-time, though ‘Gate began the second period strongly, Nathan Wake and debutant Steve Lennox carrying strongly. Fly-half Andy Mackay kept Knottingley on the back foot with a series of probing kicks and Joe Bentham and Ned Rutty both came close to finding a way over the try-line. A quick tap from Rutty saw him stopped just short once again, this time illegally. The Pythons opted for a scrum, driving their visitors back over the whitewash for Mike Ruthen to touch down. Mackay added the extras to reduce the deficit at 26-7 on the hour-mark. Dorian Ennequin then put Mackay away down the blindside, Jonathan Pickard picking up, only to be stopped within touching distance. Again the 'Gate pack drove Knottingley over the line and Bird applied a finishing touch. The visitors began to tire in the closing stages, meaning that the Pythons ended the game pushing hard for another try, but there was no way through and the final whistle sounded with the scoreline still reading 26-14.